The EyeClops Bionic Eye is not like the typical microscope that you'd see for sale; instead it brings magnification to a whole new level and location. It makes microscopic exploration fun for the entire household. The EyeClops is a hand-held microscope that works by projecting images onto a TV. All one has to do is plug it into a television, turn it on, and get ready to view household objects at up to 200x magnification. 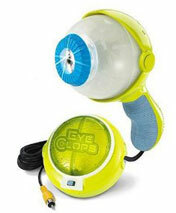 With its detailed images and ease of use, the EyeClops effectively blurs the line between educational tool and fun toy. One thing we loved about this product is that it works by simply connecting to a television, giving users the ability to share their findings with family and friends. It plugs directly into the A/V port that can be found on almost any television, so it's easy for even the non-technically inclined to hook it up. Speaking of easy, another thing we enjoyed was how simple it was to operate. There is no software requirement, so you can just plug and play. Once connected, it can magnify objects up to 200 times. This not only turns the television into an interactive device (a nice change), but it allows budding scientists to easily share their findings with others. The Bionic Eye comes with both a Petri dish and test tube. This lets the user examine substances or objects that are hard to handle. It also has three built in LED lights that help illuminate specimens for a better view. In terms of power, it uses five AA batteries (not included). This makes it very portable, although you still need to be able to plug into a television in order to view objects. Yet it can easily travel throughout the house and neighborhood. As for picture quality, most users report being surprised at the fine details the Bionic Eye provides, although it's not uncommon for the image to appear grainy with some static. Be gentle with this product, although it yields some amazing details the lens is prone to scratching and damage if handled too roughly. We have heard of some complaints about the EyeClops. Some felt that the zoom controls were touchy, so practice and a steady hand is needed to obtain a good image. Others felt it was easy to lose the specimen entirely when using the highest magnification power. This could be very frustrating for young users that are lacking in patience. Overall, the EyeClops Bionic Eye is a fun toy that can ignite the curious mind. Adults and kids will like the power and potential of this unique microscope. The ability to put images on the television screen makes it easy for the entire family to use and enjoy. There is really is no limit to what users can examine and explore. Although the Bionic Eye is a fun way to explore the microscopic world, it's still mainly advertised as a toy. Customers who are expecting more than that, such as a higher-powered kids microscope, may be disappointed. Recommended for: Children six and up will get the most out of the unit. The sensitivity of the zoom feature and need to connect to a television make it better suited for slightly older kids. Younger kids can certainly enjoy it, but they may need some assistance. Buy the EyeClops Bionic Eye at Amazon!